Chesworth’s work explores ideas about language and representation within broader cultural contexts. His distinctive and accessible musical surfaces often camouflage deeper explorations of relationships between performers, audiences and the artwork itself. 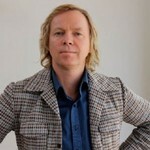 David Chesworth's distinctive compositions and sound-art installations have been performed and exhibited extensively in Australia and overseas. His work has been featured in major festivals including Ars Electronica, Festival D'Automne de Paris, Edinburgh Festival, BAM's Next Wave Festival in New York, Bang on a Can Marathon, Sydney Biennale and Adelaide Festival. Chesworth is the artistic director of the David Chesworth Ensemble. They have released three acclaimed CDs, the aria nominated Exotica Suite, Badlands and recently, Music to See Through. The ensemble has given numerous performances including the Melbourne Festival and the Sydney Spring Festival of New Music. The ensemble has performed in Europe and the USA, including the BAM Next Wave Festival and Bang On a Can Marathon. Chesworth recently completed Cosmonaut, a major new work commissioned by Opera Australia. His first opera, Insatiable, was completed in 1986. Since then, he has worked with Melbourne's Chamber Made Opera (Recital, The Two Executioners and Lacuna), and with the Melbourne Festival (Cosmonaut and Sabat Jesus). Together with collaborator Sonia Leber, Chesworth is a director of Wax Sound Media which has created a series of innovative public-art and museum installations including 5000 Calls, a permanent 'sonic environment' for the surrounds of the Sydney Olympic Stadium, The Master's Voice, in Canberra's City Walk and The Gordon Assumption, commissioned for the Melbourne International Festival Visual Arts Program. They recently presented work in Ljubljana and Cardiff. Their new work Proximities: Local histories/Global entanglements, commissioned to celebrate the Melbourne 2006 Commonwealth Games was recently launched on the William Barak Bridge, Melbourne. Chesworth has received numerous awards. Southgate received a Prix Ars Electronica Honorable Mention. Sabat-Jesus was selected for the 1994 Paris International Rostrum of Composers. Insatiable received an A.T.O.M. Award for Most Innovative Film, and The Two Executioners received the inaugural Age Performing Arts Award for the Most Outstanding Fringe Performance. In 1997 he was awarded a Churchill Fellowship to pursue studies with Robert Ashley and Gavin Bryars. In 2001 he received a Green Room Award for his sound design of Melbourne Theatre Company's production of Life After George. From 1978-1982 Chesworth co-coordinated the Clifton Hill Community Music Centre in Melbourne, a centre for experimental music, performance, film and video. He performed extensively during this time with groups like Essendon Airport (1978-83). He also released several recordings including two acknowledged classics: 50 Synthesizer Greats and Sonic Investigations of the Trivial with Essendon Airport, both recently reissued on CD. Someplace : ballet On the line commissioned by choreographer Cheryl Stock and Queensland's Dance North. Vanishing Tekopia (unspecified voice with chamber ensemble) (2011) Audio CD partly commissioned with funds provided by Julian Burnside. Towards time : for symphony orchestra (2001) Commissioned by Symphony Australia for performance by Adelaide Symphony Orchestra. Rare/very rare/possibly extinct : music for amplified harp (1996) Commissioned for Marshall McGuire.